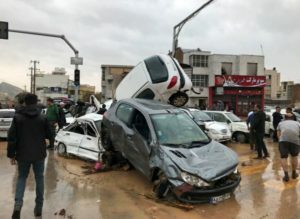 “At least 25 people were killed in the recent flash floods in Iran.” Ahmad Shojai, Iran’s chief state coroner announced. According to Shojai, 18 people were killed in southern city of Shiraz and all the victims have been identified. At least 2 people were killed in the northern province of Golestan and 5 people were killed in Mazandaran. Authorities had warned about possibility of floods in the capital Tehran as well as in the oil-rich southern province of Khuzestan in the next 48 hours. Both are now witnessing floods. 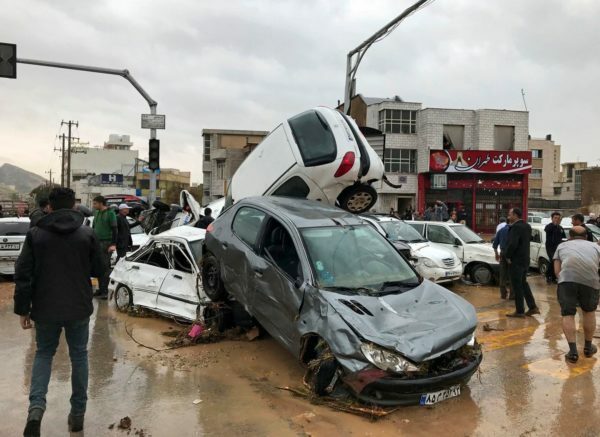 Iranian media showed pictures and footage of crumpled cars piled up deep in mud and water after floods swept through Shiraz. Last year, at least 30 people were killed by flash flood in the Iranian province of Eastern Azarbaijan. “The unprecedented flooding in Iran is a side-effect of global warming”, Ardalan Tootchi, a fluid-dynamics researcher in Paris 6 University told Zamaneh Farsi. However, he warned that the mismanagement of water resources and dam-building projects have contributed to the recent tragedy.